While the past two days in California have been a real whirlwind, I have to say that they have been two of the most fun I have ever had in my 30+ years of attending concerts (that’s right, I saw my first actual concert at the age of 7). 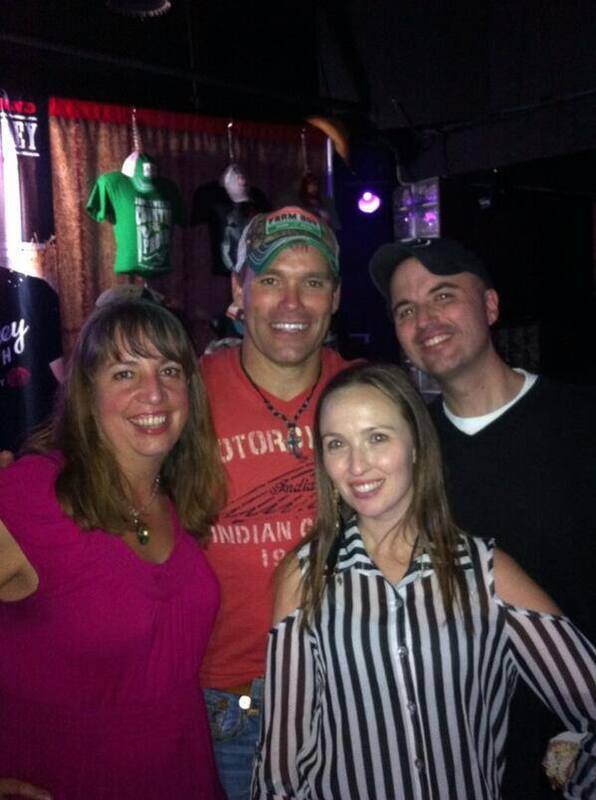 Not only did I have the opportunity to catch one James Wesley show (at the San Benito County Fair), I had just enough time before my Saturday morning flight out of San Jose to take in a second the following night at Mavericks Country Lounge in Pleasanton. Now, before I go too far, I can’t forget the rest of the band including Michael Blakemore, Jesse LaFave, Neil Alexander and Travis Laws because they’re pretty damn good at what they do. To be a successful solo artist, you need a supporting cast that plays as a team. Cohesion, combined with hard work and dedication, is key to a successful live show. 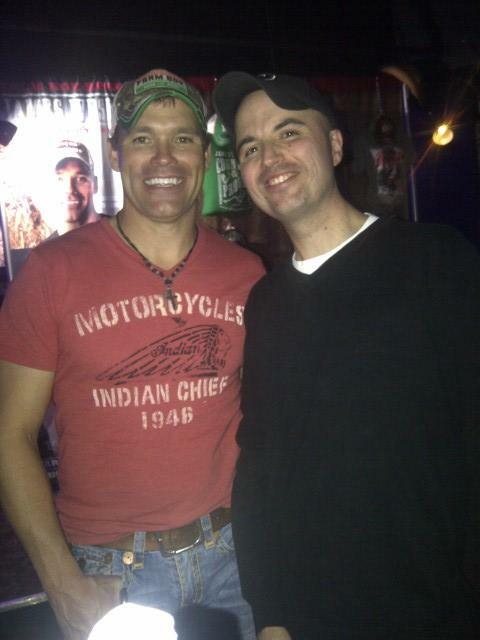 These guys have all of these attributes, and I would have to say that they are some of the hardest workers in the industry and deserve to be recognized for the effort they put in night in and night out to make a James Wesley show what it is. 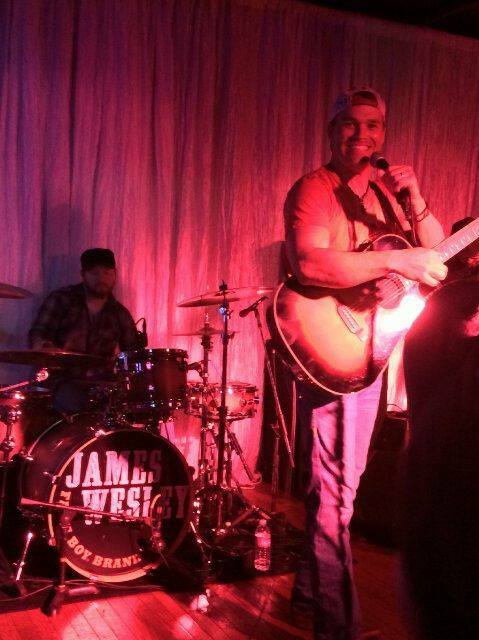 People often ask me: what’s the best way to describe a James Wesley show? How about high energy. How about highly entertaining. How about worth every penny. Do you get the idea? 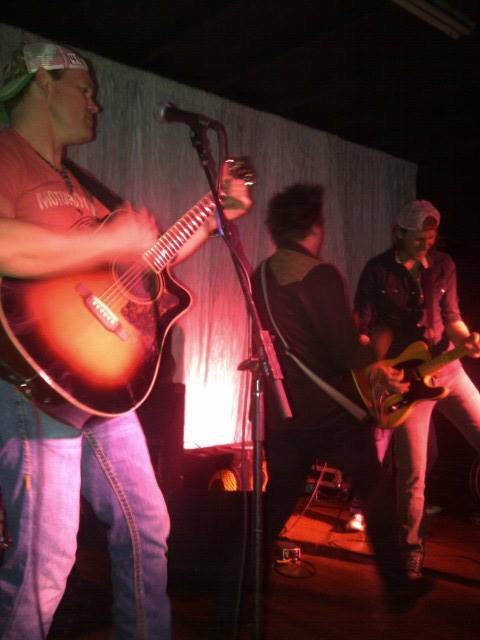 I’ll put it another way: just like me, it’s a little bit country and a little bit rock and roll! I could go on and on with descriptors but I don’t want to bore you with my ranting. Now, back to the show(s). 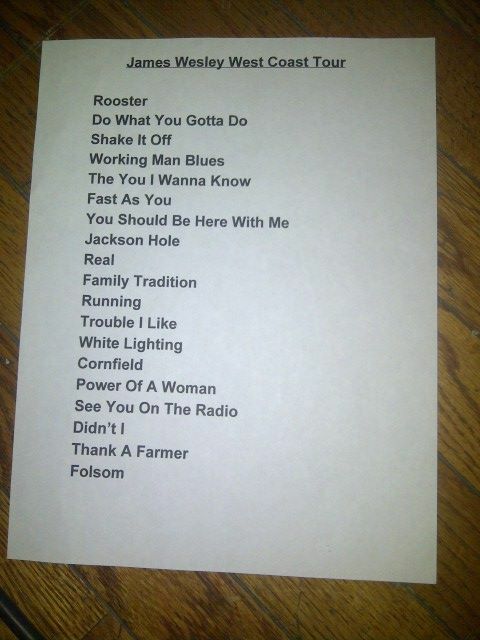 Besides the staple set list songs that I mentioned earlier (Jackson Hole, Real, Didn’t I, Thank a Farmer) we were also treated once again with a selection of “new” songs that haven’t made it on the radio yet. 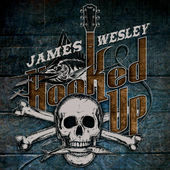 Heck, maybe we can find them on an album in the near future (side note for Broken Bow Records: I would LOVE to see a James Wesley live album to showcase his talent). I’ve said this before, but i want to be sure that I touch upon this again in this review: there are a few songs that I expect will be hits in the near future, if given the opportunity. 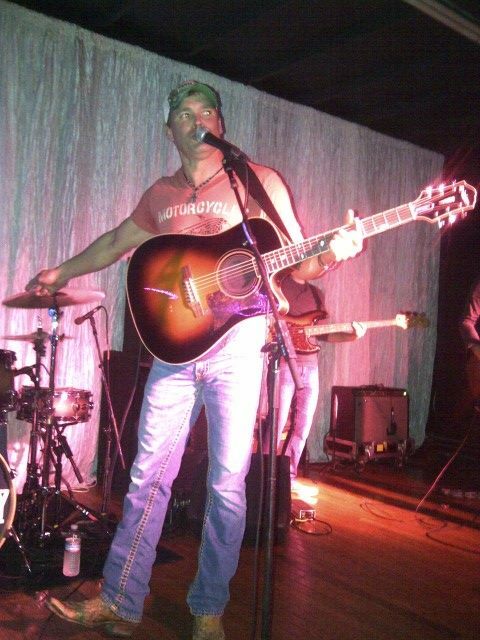 These songs include: “Cornfield”, “Trouble I Like”, “The You I Wanna Know”, “Running” (co-written with Marcum Stewart and Zac Wrixon), “You Should Be Here with Me”, “Do What You Gotta Do” and “See You on the Radio”. These are just a few songs that continue to stick out for me as having the potential to be radio hits. The later, was the closing song on the set for this show and it certainly has the legs to make a solid run on country radio. Other songs, such as “Rooster” and “Walking Contradiction” are two that always jump out at me during the live shows. Both of these tunes always get the crowd on their feet, and at both shows this week, I can safely say that they did it again. Particularly at the Pleasanton show where you had scores of attendees performing aerial dance maneuvers during each. But while it’s always great to hear original songs, let’s not forget about the beauty of the cover song. Especially at a live show. 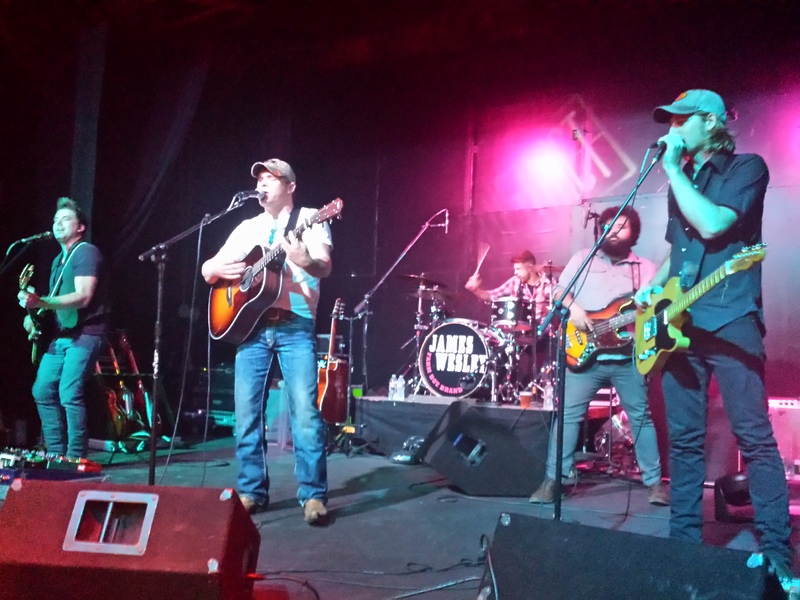 One thing that Wesley and the band like to do is mix their own music with the sounds of Merle Haggard, George Jones and Johnny Cash. Some “I’m a Lonesome Fugitive” and “Mama Tried”. A little “White Lightning”. Even an encore of “Folsom Prison Blues”. Fantastic stuff. I didn’t get to mention that I was able to enjoy the company of Wesley and the band following both shows: once at Wingstop (Hollister) and once at In n Out (Pleasanton). It was fun to just hang out and chat. Talk about the shows. The music business. Our friends and family. Sports. Whatever there is to talk about at 2 a.m. It’s the little things like this that remind you that musicians are people…just like us. They go to work. They have families. They spend a lot of time on the road. Sometimes we all just need to sit back and realize that we have one life to live…and enjoy it! It certainly seems like these guys are doing just that! So that’s it. Two more shows in the books. I had a fantastic time and as I sit here at the airport, getting ready for my flight back to Portland, I’m once again going back through the photos and videos and realizing what a great two days it was!